Sir my son has flu since morning. He is sneezing and snot comes out of his nose. Shall i give arinac or what? Yes, ARINAC is best medicine for Flu. If your son is below 8 years, then give him Arinac Syrup three times a day. I am having sore throat and flu. Can i take augmentin with arinac? Yes you can use augmentin with arinac, if you are above 18. If you are above 18 years, Take Klaricid 250mg three times a day. Take Augmentin 625mg tablet three times a day. Sir i have chronic ethmoidal sinus infection which cause ear pain and excess mucus production ..u have tried antibiotics but it didnt work..so which med is best for this disease.. If you are above 18, Take Augmentin 625mg tablet three times a day. My freind is 6 weeks pregnant can she use arinac for congestion and cough because of flu. Yes, your friend can use Arinac Tab in pregnancy. It will not hurt the baby. My wife is having 17th week of pregnency. We dont have any other medicine right now except arinac syrup. Can she take the syrup for high temperatue and flue? Green Mucus in throat nose nd chest nd chesti deep cough… nd even if i get well maximum after 1 week mucus comes back.. I have flu, cough n fever.. n its for the third time in a month.. but this time i have chest pain also from few days.. what should i do?? Take piriton tab plus Arinac Forte three times a day. Hope you are above 18 years. Hi sir. I have get this attack of flu and sore throat 2nd time in one month. I didn't take any medicine last time, only took arinac and it was gone in a week. Now it has attacked again and it's severe. My nose is obstructed badly. Also feeling alot of pain in jaws and head. Which drug to take? I am having freeze flu result in heavy head and cough for past 1 week , Please recommend me something strong . I also have problem of sinus please advice accordingly . 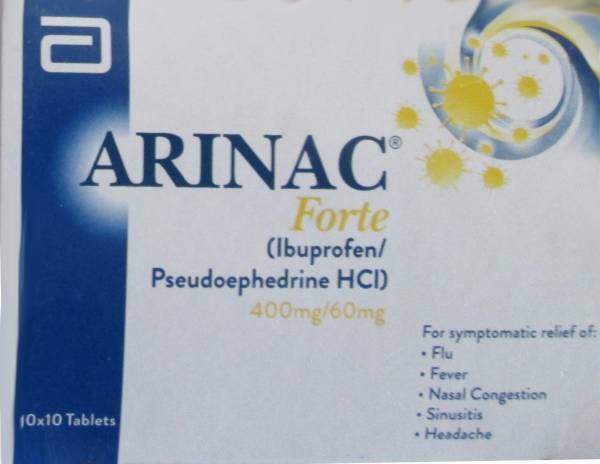 Have heard arinac forte causes accumulation of sinuses .. prevent them from drainage and worsen the sinusitis? Is it true? Yes use Arinac Forte and use any Inhaler, which will open your nose. Well every medicine has some side effects but it all depends on the patients. Some patients are allergic to some particular drugs. Take Augmentin 625mg tablet two times a day for 6 days. Hope you are above 18. Can i take leflox 250mg with arinic fort ? My daughter is 1.5years old…she is suggeriment from sobre throat and flu…Can i give Arinac syrup? Yes you can take Leflox with Arinac forte, if you are above 18. Sir, my both nostrils are blocked. I used xynosine but temporary relief. Little heavy head too. Please suggest if i shud take Arinac? Take Arinac Forte plus Piriton tablet three times a day. If you are above 18.
and Augmentin 625mg tablet three times a day. Yes you can take Pandol with Arinac forte. Take Arinac Forte tablet three times a day. For back bone pain take Nuberol Fote tablet. Hope you are above 18. I am having cold flu for the last three days , taking Arinac+Panadol — Today I am feeling pain in stomach, is it due to medicine? What medicine should I take. I've been facing severe nasal congestion since 5 days, started taken Fexet-D yesterday. Should i take Arinac forte with it or what do you suggest? I'm male, 36 years, smoker. main last 2 years se shadeed qism k cough and flue mein mubtila hn, musalsal cough banta rehta hai aur nazla rehta hai aur mujhe bar bar spit bhi karna parta hai, please koi moassar dawa suggest karein. Take Arinac Forte plus Avil 25mg Tablet Two times a day. If you are above 18. Can I take arinac more than 3 times a day ? Sir. I m 24 years old. I have very sensitive throat and it's been a disaster for me. I m having thorat swelling and flu with fever. I have used calamox 625mg with Rigix tabs for 3 days .three times a day. Bt no significant results.still nose is running and throat is in bad condition . kindly a suggest some good and effective medicine. 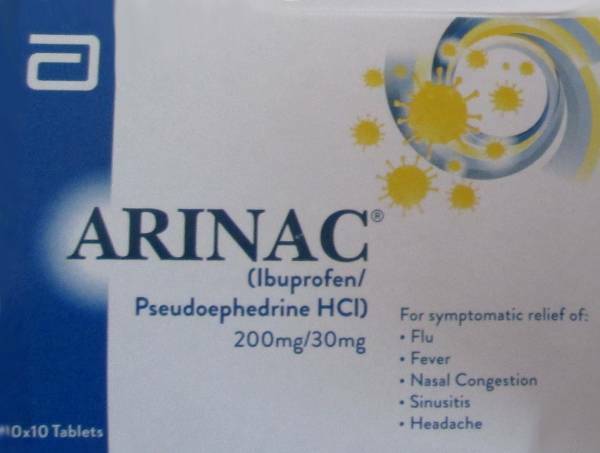 Take Maclacin 500mg tablet three times a day for Throat and Arinac Forte tablet three times a day for flu and fever. My brother is suffering from severe chest congestion and mucus in throat which doesn't comes out with coughing … He coughs whole night and can't sleep and now feels pain in his body, may be due to coughing severely … He caught fever earlier but that is now moderate. My brother has taken the doses for day 1 but still we dont see significant relief in coughing caused by mucus in throat … he is unable to sleep due to coughing … Please suggest something that can provide relief from mucus and coughing quickly? Should we go ahead with the above refereed medicine for three days as described by our doctor? Thanks! If your brother's case is in severe condition, just follow your doctor. I am suffering from Flu from last three days , not feeling fever but feeling dull and drowsy . I have been told not to use any medicine for three days if you have flu otherwise you get dull mind for many days . No, you have to take Arinac Forte Tablet three times a day. I got nasal congestion when i lie on bed either to take rest or to sleep.i have this problem since 2-3 years.How can i cure it? Take Arinac Forte Tablet Three Times A Day for 5 Days. My baby is 4 months ans is having flu symptoms (runny nose and cough)unable to sleep properly.please guide is arinac suitable for 4 months and what dosage to be used? My baby is 4 months and having flu symptoms (runny nose and cough)no fever.please guide. And rup thin layer of Vicks balm arround the neck. Can arinac fort be taken during pregnancy? Evidences has shown no side effect of Arinac forte in pregnancy. I am 32 years married Male, since last one month suddenly i am having pimples on my face on nose, forehead and cheeks, these are big pimples with puss, please suggest something for this. doctor your are great thanks for helping. Take Klaricid 500mg tablet two times a day. Hope you are above 18. My wife has sore throat so, having pain.She is also breast feeding, please suggest medicine accordingly. Use Klaricid 500mg Tablet for 5 days. Hope you are above 18. Doc sir. From last 4 days. My left ear is blocked and u feel air pressure in that blcokage. When I stretch it with fingers it gets open but right after i release the finger, ear gets block again. I dont have any type of pain in ear but only blockage. Please suggest should I take arinac or anything else. Take Klaricid 500mg Tablet two times a day with Arinac Forte tab. You need to consult with your nearest doctor's, because its bleeding. Use Klaricid 500mg tablet two times a day with Zyrtec Tab. Sir mien 7th month pregnant hun bohat severe nazla hai with scratchy throat and cough kya le sakti hun medicine jo safe ho.. arinac simple chalegi? I am taking leaflox500 once a day and arinac tablet 2 times a day from 2 days but still i have a fever n flue . Advise me what to do? Take Zyrtec Tablet two times a day along Arinac Forte. Use Arinac Forte Tablet two times a day. What is the side effect if s0me0ne take arinac, brufen and erythromycin t0gether? There is no site effect of using those three together. In some cases it may react. I am having severe pain on the left side of my head whenever i cough. Sometimes there is mucus coughing and it causes severe pain on left side of my head. what about headache during coughing, i also experience same headache while bending. Consult with your nearest doctor, because your grandparent has hypertension and diabetes. Its difficult to suggest you any medicine without any diagnose or sample. Sir,I have been facing worst kind of flu since childhood many time i has got medicine treatment but get not rid.In privous i only was faced flu in cold but this year,I’m facing all the time many product can use but failed to get rid please sir my humble request is recommend me good medicine, due to flu my eyes remain red flu putting pressure on my eyes suggest me good medicine Thank you. I am having upper throat pain. What you prescribe me? Feel when drinking water / swallow. Dr sb kindly tell me medicine for sour throat. Feeling pain in neck while drinking water. Can arinac be taken for bursitis? Sir arinac forte of how much mg ? Sir.. I have a problem of sinus. I had a surgery for it since then it’s relaxing but whenever the weather change, I had to deal with the nose running, throat pain and mucus. So plz suggest me better medicine for its treatment. Sir i have flu for last 2 or 3 years please recommend best medicine because i try many tab including arinac tab but it doesn’t work fully …. and breathing with voice all time ? Medicine with time and duration ? Dear Dr. sahib, I have infection in my nose, due to which I feel much pain in front of my nose. Moreover, I am suffering with flue with water. Kindly advise. AP apny baby ko 2ml 3 time dasakhty ho ..
AOA. My 25 days old is having serious constipation and pass stool only with glycerine supporties stool is sometimes like. Pallets. And some time.it comes. With minor blood. Now she has nasal congestion pl. Guide some medicine. Is babynol ok for her? Ap usay Colic drop or Panadol drop dedain.. In past I used to take arinac forte but now it is not available in stores so what should I take? Is arinac safe in lactation, if not, what should I take instead of? Feed your baby before taking Arinac. I am suffering from cough with phlegm and breathing problem too. Suggest medicine. My daughtr is 1year 1month old and she is facing flue plus fever which syrup should be given ? i am 28 and is taking coldrex and arinac syrup since last 3 days now .. i also took fedxed d first day …. Aoa. My daughter is 9 month old. She is having fever n cough. N scratching her ears. Can i give arinac suspension? Aoa. My one month old son is having cough and breathing problem, especially while feeding. Also different noises came while feeding and when he is sleeping. Plz suggest medicine. Ghrrr ghrrr ghrrr sound is promonent during sleep. Is it safe to take arinac while breast feeding?? Aoa. I am 33 year old. I have mucus and chest conjection history since childhood. Currently i am suffering since 2month and i have done 2times (5days) levo. With telfast d and montilucast but still not recovered yet. Ki dly suggest. Sir I am 32 years old. I have flu for the last 05 days and little bit of fewer as well, what medicine should i take.